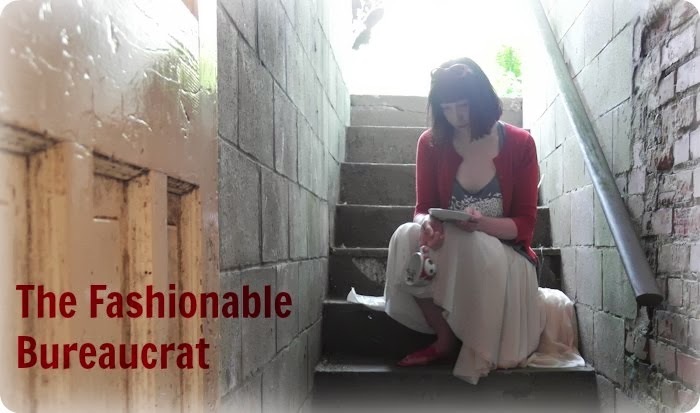 The Fashionable Bureaucrat: Monday night excitement! So here's what I wore to work yesterday. La la la la la. La la la. Here's the back. Someone at work asked me how I found tights the exact same colour as my shoes. Just luck! After work, I walked home and though I perfectly intended to wear this out at night to a MOST EXCITING EVENT but I ended up having a wardrobe crisis and I changed because I had been invited to a party. At the Fluevog store. In the Distillery District. Yeah, that's John Fluevog and me. Whateves. Just a normal everyday thing. Except it WASN'T! It was so very exciting! I was so nervous and I may have been a little star struck. That's strange isn't it? The manager, Andrew, was so sweet in coming with me to get my photo taken and then John signed my shoes. My crazy vintage purple pointy toed Fluevogs that I got in ebay a few years ago. I'm so glad I changed and wore these because I learned that these were from a shoe line in the 1990s. Really, he was very gracious and lovely. I'm glad I finally got to meet him. My only regret? I forgot to tell him that we share a birthday! I think he was in Toronto for the Air Canada announcement since Fluevog will be providing the shoes for the new flight attendant uniforms. I hope his staff don't think I'm totally crazy. I didn't stay very long since there was a big crowd and I'm not good in crowds. I'm very happy that I was invited to this event. And here's what I wore today. Blah blah blah. When I bought these shoes I had no idea how perfectly they would match this dress but they do. It's the pink buckle that really pulls it together. You're a genius John Fluevog! A few months ago I won a $100 gift code from Peek Brooklyn these are one of the pairs of tights I purchased. Pretty Polly tights are great quality. I've worn these about 4 times and they look as perfect as when I opened the package. So cool that you got to meet him and got your shoes signed. Those shoes are the bomb. Was wondering what shoes you'd wear. Love them. You're looking so happy. OH! You got to meet him! I'm so envious! 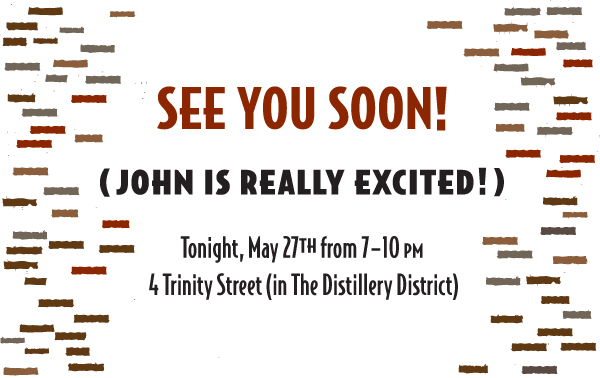 I have a work-friend who knows John and his wife, and I keep begging him to introduce me. I adore your vintage 'Vogs - so sweet! And you wore "our" dress! 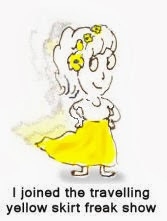 If I ever meet John I will have to wear mind, and then I'll be all, "Yes, I know her! The lady with the purple shoes!" Cheeky girl! Love the tights. 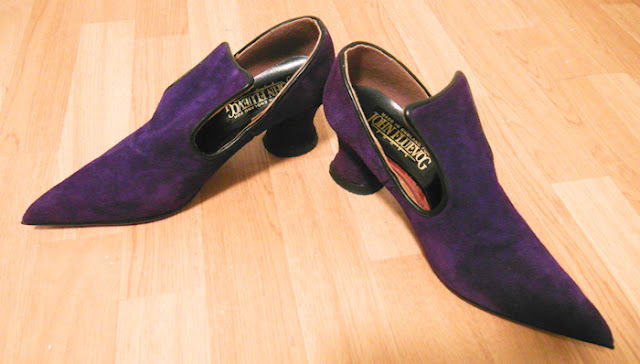 so fabulous that you've met Mr.Fluevog himself, and he signed your shoes, pretty purple shoes! what else??? Love that first dress, such a funny and cool print, you rock!! And also love every pair of shoes you're wearing, as usual!. And love that tights detail! This is a great post Megan, and it's great to see you having such fun! 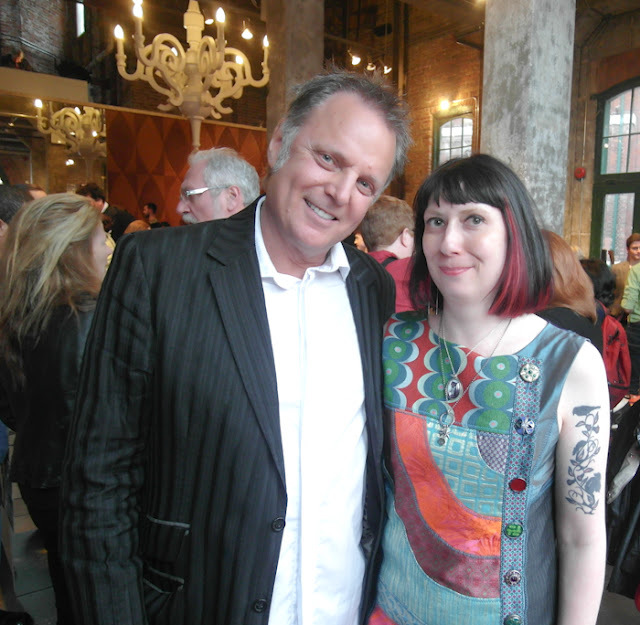 I'm very envious that you got to meet Mr. Fluevog himself (he is a rather dashing man, isn't he?). You chose the perfect shoes for the meeting. I'm in love with both of the outfits in this post - the dresses, tights and shoes are all working together to create some serious spektacular outfit action. Oh wow! Hee hee! I gasped when I read this. It must have been so exciting! What a great evening. Those were definitely the best shoes you could have worn. I am HSP too and don't love crowds either. Wow, blah, blah, blah, Wow, la, la, la! Both dresses are fabulous, actually all three dresses - I'm sure you were very memorable to Mr. F.
Such fun meeting John and getting your shoes signed! Those aren't really very vintage though. 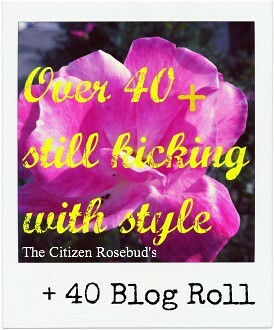 I wore Fluevogs to my wedding - in 1971! Always sorry I gave them away now. (Kept the husband.) However I do still own a pair of Angel boots from the early '90's. Guaranteed Satan-resistant. You are still the Queen of Fluevogs, Megan! 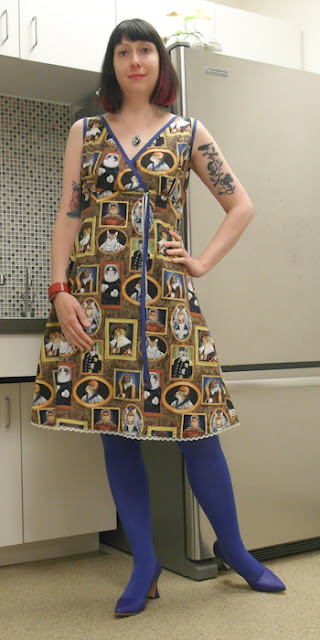 Cat dress, cat dress!! Love it. I've been displaying my retro Vogs since I haven't been able to spare the time to get them fixed up, but they are really gorgeous! I love your older Fluevogs. 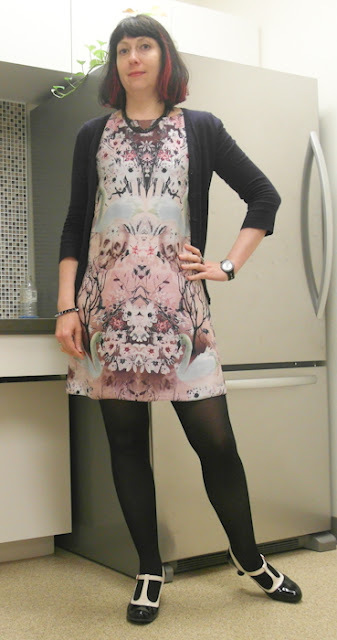 I still adore that printed dress. It's so very McQueen. I love those tights. I think it's so cool that you got to meet the Fantastic Mr. F.
Oh wow! I would have been star-struck and speechless. So glad you braved a photo op and shoe signing. Love that 'vogs are part of the new uniforms for Rouge. Imagine that? And those stockings! Love! I would have been speechless too, and grinning like a maniac! Oh, you met the man! I have those purple shoes in green with tan leather trim, very early '90s, bought from the Vancouver store. The round heel shattered when I put them on after a few years of not wearing them. I swear, you have the best patterned dresses and crazy cool tights.